A From Taipei: Chengde Rd. Sec. 7 → Turn right at Daye Rd. → Turn left at Lane 527 then keep going. B From Beitou: Beitou Rd. → Go past Daye Rd. intersection and continue on to Lane 527 of Daye Rd. ; or Zhongyang N. Rd. Sec. 1 → Turn left at Daye Rd. → Turn right at Lane 527 then keep going. C From Tamsui: Dadu Rd. Sec. 1 → Turn left at Daye Rd. → Turn left at Lane 527 then keep going; or Zhongyang N. Rd. Sec. 3 → Turn right at Daye Rd. → Turn right at Lane 527 then keep going. ● Take the Tamsui Line, then get off at Fuxinggang Station. Go to the 2F of the MRT station and use the No. 2 "Beitou Depot" exit. 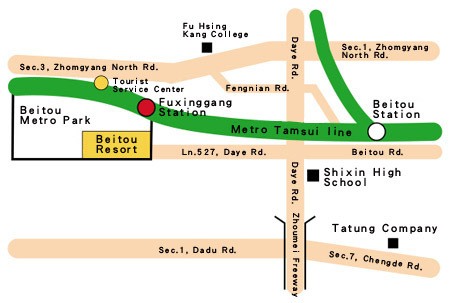 Cross the footbridge then follow the signs for the "Beitou Resort".